The 14th Summit of the Northern Corridor Integration Projects (NCIP) held in Nairobi on 26th June 2018 reaffirmed the Leaders’ commitment to advancing regional integration while underscoring the importance of accelerating socio-economic transformation, industrialisation and employment creation. 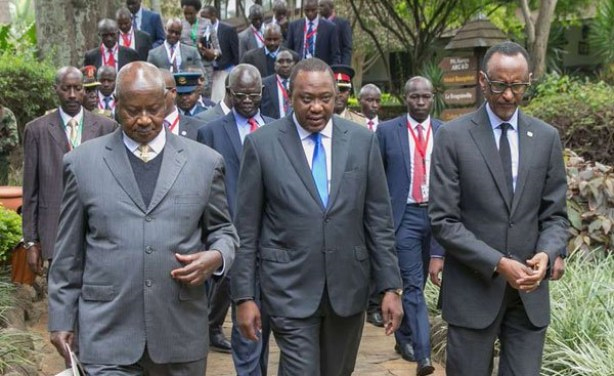 The Summit hosted by H.E Uhuru Kenyatta, President of the Republic of Kenya, was attended by H.E Yoweri Kaguta Museveni, President of the Republic of Uganda; H.E Paul Kagame, President of the Republic of Rwanda; and Hon. Aggrey Tisa Sabuni, Presidential Advisor on Economic Affairs, Republic of South Sudan. In attendance were the representatives of the Republic of Burundi, Democratic Republic of Congo, Federal Democratic Republic of Ethiopia and the United Republic of Tanzania. The Ag. Executive Secretary of the Northern Corridor Transit and Transport Coordination Authority (NCTTCA) and the Private Sector representatives from the Partner States also attended the 14th Summit of the NCIP. During the summit which was preceded by a ministerial meeting, the leaders reviewed the progress made in the implementation of the various resolutions reached at the 13th NCIP Summit. Among the key projects that featured prominently during the meeting is the Standard Gauge Railway (SGR); which is a flagship project aiming to connect the port of Mombasa to Kigali and Juba via Uganda. On the SGR, the Summit directed that the concerned to expedite financing options for Kampala-Bihanga-Mirama-Kigali, Tororo-Gulu-Nimule/Gulu-Pakwach sections. The Summit lauds the completion and commissioning of Mombasa-Nairobi section of the SGR in 2017 which is already transporting an increasing number of passengers and cargo. President Kenyatta underscored the immense benefits of the joint interventions initiated under the NCIP since its inception in 2013. “It is definitely good news for our citizens,” said President Kenyatta as he cited joint actions such as the Single Customs Territory that has resulted in reduced transit times and cost of goods. He assured his regional colleagues that Kenya would sustain the momentum in the implementation of the remaining phases of the SGR to reach the Kenya-Uganda border town of Malaba. President Museveni emphasized to the Summit that, Uganda’s economy relied largely on its neighbours such as Kenya that buy its excess produce such as maize and milk. “I used to take milk from Kenya, but now it’s Kenya and other East African countries that are consuming our milk. We have about 2.5 billion litres of milk but we can only consume 800 million litres, the remaining 1.7 million is being consumed by other East African countries,” said President Museveni. He directed Uganda Revenue Authority officials based at the port of Mombasa to ensure that there is no backlog of cargo destined to Uganda at the port. 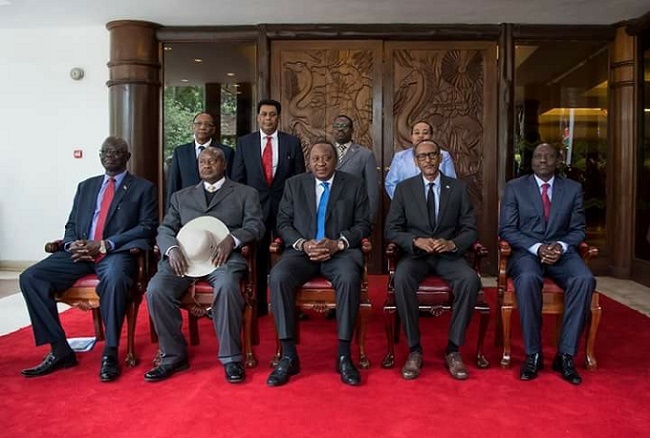 President Kagame thanked President Kenyatta for reconvening the Summit after a two-year break. He called for the re-examining of the efforts required to enable the implementation of joint projects that will develop lives of citizens. “We had made headway in bringing government, businesses, local and foreign investors in partnership to enable these projects that are important to the development of our citizens. We can now keep up the momentum in fashioning and implementing joint initiatives and projects for the benefit of our region,” said President Kagame. To ease the circulation of petroleum products in the region as a key source of industrial and domestic energy, the leaders agreed to come up with “the Lake Victoria intermodal transport system” pending consultations on re-scoping of refined petroleum products pipeline. Further, the leaders agreed to allocate more funding for the development of centres of excellence to support creation of requisite human resource capacities needed for the implementation and sustenance of NCIP projects. On the setting up of a commodities exchange mechanism, the Summit received an update on the harmonisation of standards for commonly traded commodities and directed partner states to fast track the process. “The summit directs partner states to expedite development of interlined trading platforms,” this was highlighted in the communiqué. The summit also considered and adopted the Accession Treaty to the Mutual Defence Pact and agreed to finalise an agreement on the establishment of a Centralised Aeronautical Database for the Northern Corridor Airspace bloc. The Heads of State were also briefed on the progress being made in ICT and were keen on the status of the One Network Area (ONA) for voice which is fully operational in all the partner states, while ONA for data is operational in Kenya, Uganda and Rwanda. Operations at the Mombasa port, a key entry and exit point for cargo in the region, was also discussed, the leaders directed responsible agencies to ensure efficient and seamless clearance and movement of cargo. To this, Kenya was to convene a meeting of Stakeholders by 31st July 2018 to consider proposals to decongest and enhance efficiency at the Port of Mombasa. The 14th NCIP Summit directed the Ministers concerned to conclude the financing agreements for the Naivasha-Kisumu, Kisumu-Malaba, Malaba-Kampala sections by September 2018. They further directed that application for finance of Kampala-Bihanga-Mirama-Kigali, Tororo-Gulu-Nimule/Gulu-Pakwach sections be expected. The Summit directed Uganda and South Sudan to fast track the bankable feasibility studies for the remaining Northern, Western and Bihanga-Kasese-Mpondwe; Nimule-Juba sections. The Summit directed Partner States to expedite cross-border mobile financial services. In view of increased threats posed by cybercrime, the Summit directed that the MOU on Cyber Security be fully implemented. The Heads of States noted the on One Network Area and directed States to ensure full compliance by all Operators. The Summit directed Ministers of ICT to consider establishing an East Africa Single Digital Market and Partner States owned Communication Satellite. In this regard, they directed their respective Ministers to carry out feasibility studies on these projects. The Summit noted the progress made in the sourcing of funding as well as the involvement of the private sector in the implementation of the Northern Corridor Integration Projects. The Summit directed the responsible Ministers to finalize bankable projects for implementation through Public-Private Partnerships. The Summit decided that pending consultations on re-scoping of the refined products pipeline, Partner States will develop the Lake Victoria inter-modal transport system. The Summit received an update on the harmonisation of standards for 18 commonly traded commodities. The Summit directed Partner States to expedite development of interlinked trading platforms. The Summit underscored the importance of developing the requisite skills for critical infrastructure such as SGR, oil pipelines and energy projects. In this regard, the Summit directed that Centres of Excellence be allocated adequate resources. The Summit noted the progress made in acquisition of land, geospatial data and valuation processes for the Northern Corridor Integration Projects. The Summit noted the good progress made in the implementation of the Single Customs Territory and observed that Partner States have rolled out all imports into the SCT leading to a significant reduction of the cost of doing business. The Summit directed Partner States to fully roll out exports under the Single Customs Territory by September 2018. The Summit directed Partner States to implement measures to ensure efficient clearance and movement of cargo from the Port of Mombasa. The Heads of State decided to hold Northern Corridor Integration Projects Summit once every four (04) months. They directed their respective Ministers to ensure that Cluster meetings are held once every two (02) months to effectively follow up on implementation of Summit directives.